We gave these makeup removing wipes a similarity score of 68%. Both wipes effectively took off our makeup, and they have a nice, thick consistency. The ingredient panels are fairly different, and the up&up version smells more like sweet florals. However, you may prefer the up&up because they use real floral extracts and Neutrogena does not. Neither wipe uses real lavender. The up&up wipes have real floral extract, so they have a more floral smell. Brandefy compares store brands (e.g., up&up) to name brands (e.g., Neutrogena) to show you when the generic is as good as the name brand, and to warn you when it is not. Our purpose is to help you save time and money, and to have a good time while doing it. If you know us, you know we love makeup remover wipes. They are easy to use and a refreshing part of the nighttime routine. 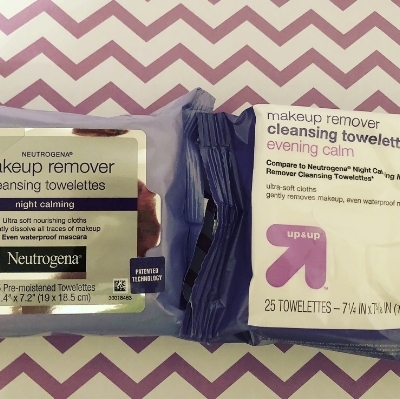 When we saw these calming lavender wipes we were stoked- typically the makeup comes off before bed, so why not throw in some lavender to help calm down? Consider us in. We found the packaging to be the same and both wipes felt nice and thick. The main difference was the smell. Both wipes have a pleasant smell, but the up&up is noticeably sweeter. If you do not like too sweet of a smell, this may not be for you. They both effectively removed our makeup. In comparing the ingredient panels, we noticed that both wipes use fragrance. Neither uses real lavender, but up&up has chamomile leaf extract as well as other floral extracts. While the Target wipes have more florals, they also have different chemicals in their ingredient panels. We liked both wipes, but will be using different ones depending on what scent tickles our fancy.